Construction of the US $58.4m Eldoret Southern bypass in Uasin Gishu County is set to kick off this January, Uasin Gishu Governor Jackson Mandago has revealed. According to Mr. Mandago contractors have been mobilized to start construction work. The road project that is being supported by the African Development Bank is aimed at easing congestion in Eldoret town. “We are very excited that the construction of this road will finally kick off. It has been in the cards for long. Soon, congestion in Eldoret Town will be a thing of the past,” said Mr Mandago. He added that Walkways for pedestrians have been set aside along all key highways and motorists and riders should not be found using these walkways. The Eldoret Southern bypass will run from the Eldoret-Nairobi Road through Eldoret International Airport. The bypass project is expected to open up the North Rift region for more business opportunities and solidify Eldoret Town as the capital investment hub in the region. Mr Mandago also cautioned the small scale traders who have set up temporary structures on the road reserves saying that they will be evicted. “Proper notice was given to them and we hope that they comply or they will be forcefully evicted,” he said. 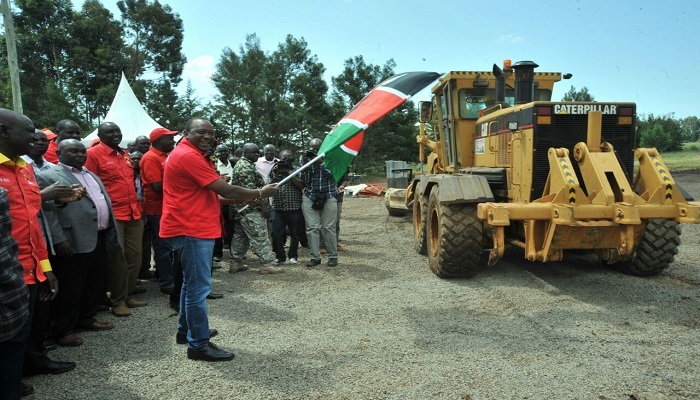 The road project was launched by President Kenyatta last year.